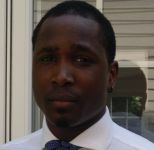 Robert Munro is a Doctoral candidate in the African American and African Studies program at Michigan State University. His dissertation, "The Dynamic Character of the Early African American Philosopher: An Intellectual Biography of Gilbert Haven Jones" seeks to place Dr. Jones within a tradition of African American scholar/educators of the Jim Crow Era. Munro’s research is the first to analyze Dr. Jones’ dissertation, which was completed in Germany in 1909, thereby earning him the honor of becoming the first African American to complete a PhD from Germany. Munro is also currently working on completing articles dealing with African American studies and the future of the American Academy, as well as an edited translation of Dr. Jones dissertation Lotze und Bowne: Eine Vergleichung ihrer Philosophischen Arbeit.